“What is public space and who controls it?” EAF16 artist Lea Cetera asks. This question arises often in Cetera’s practice, which aims to disrupt people’s behavior in and response to public space. For her project at Socrates, Cetera invokes design, experimenting “how design can influence and inform how we move through public spaces.” Her project, Design Within Reach, features three brightly colored steel chairs based on iconic chair designs. She views the chairs in context of her theater set-designing experience as objects intended to influence movement and shape interactions. Cetera’s project also addresses accessibility and, specifically, who has access to design: “who is it for, and then why?” By realizing the designs of the Wassily Chair, Barcelona Chair and the LC2 Petite Modele Armchair in steel and placing them in a public park, Cetera hopes to draw attention to their fraught history: these chairs were all originally intended for a wide audience but over time evolved in the luxury items accessible only to a few. “Designers can start off with utopian ideals of designing a chair for mass use, and then somehow it gets to point where you can only be of a certain social status to ever know what it feels like to sit in an Eames chair, or a Breuer chair,” the artist says. From Sprawl to Socrates, Cetera wants to further address the urban environment and explore how we understand and interact with public space. 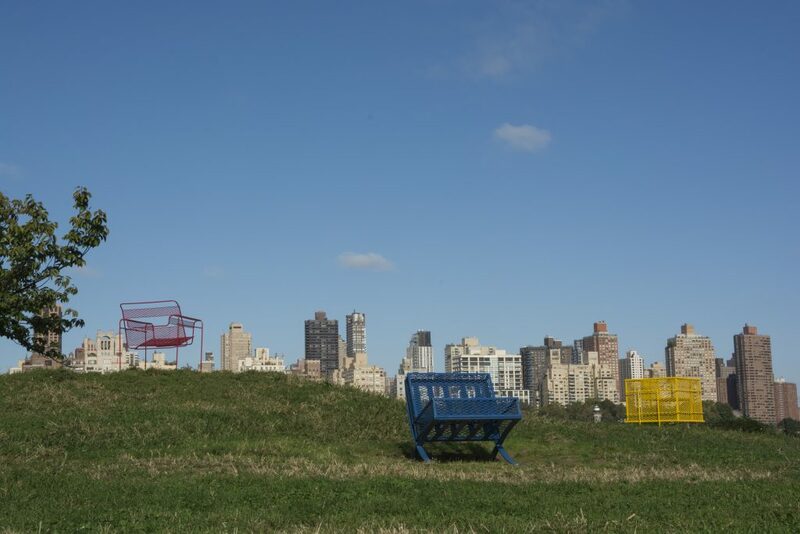 When looking at the level to which public space is controlled, the artist considers it a transgressive act to place these chairs and benches within the park, especially considering their relationship to class, value, and design.